James, left, and Grady Clark, 13, visiting Anna Maria Island from Colorado, find success fishing near shore Nov. 29. With shiners as bait, they were guided by Capt. Warren Girle to a dinner catch of mangrove snapper. 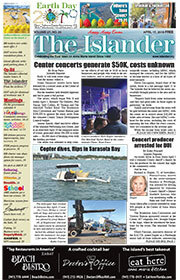 Despite some recent cold weather, fishing around Anna Maria Island is holding fast. With late-season shiners available as bait, many anglers are finding success in the back country and out in the Gulf of Mexico. Fishing the flats for snook and trout is still going strong. I’m finding the snook fishing is improving during the afternoon tide, when the water temps are reaching their peak. Remember, snook season closed Dec. 1, so all linesiders are catch-and-release. As for trout fishing, deep and shallower flats are producing a bite. I suggest using a popping cork or a facsimile while baiting shiners, as most trout I’m hooking up with are on the small side. When using the smaller bait, you’ll find it a lot easier to cast with a weighted cork added to your rig. While fishing offshore, the shiners are working well for Spanish mackerel, mangrove snapper and even bottom-dwelling cobia. For the macks, a free-lined shiner on a long shank hook will get you connected. As for the snapper, a circle hook and egg sinker made into a knocker rig will get your bait down where the snapper are feeding. And while you’re doing this, don’t be surprised to hook into an occasional cobia. They’re down there and the brown bombers aren’t picky about big or small bait. Capt. Warren Girle is working nearshore structure for a variety of species. Mangrove snapper are being caught while bottom fishing with live shiners. While bottom fishing for snapper, Girle’s clients are reeling up loads of Key West grunts and porgies. Red grouper and cobia are present, too, but they are not being caught with the regularity of the snapper and grunts. Inshore fishing is providing Girle’s clients with rod-bending action. While fishing deep grass areas with free-lined shiners as bait, Girle is putting clients onto spotted seatrout and bluefish. Slot-size trout are being caught as well as many under-slot fish. As for the bluefish, 5-pounders are not uncommon. Capt. Aaron Lowman is snook fishing on the grass flats of Sarasota Bay. Despite cooler water temperatures, Lowman is finding good numbers of snook since the species went out of season and he’s catching them, too. Live free-lined shiners or shiners under a popping cork are Lowman’s bait of choice, although the species is out of season. Moving out into the Gulf of Mexico, Lowman is finding plenty of Spanish mackerel and kingfish. Large shiners or threadfin herring as bait are triggering the kings to take a taste. As for the macks, small shiners or Gotcha plugs are working well. Reef fishing for Lowman also is providing action for his clients. Bottom fishing with live shiners as bait is resulting in mangrove snapper, grouper and an occasional cobia. Jim Malfese at the Rod & Reel Pier says fishers there are using live shrimp as bait with success. 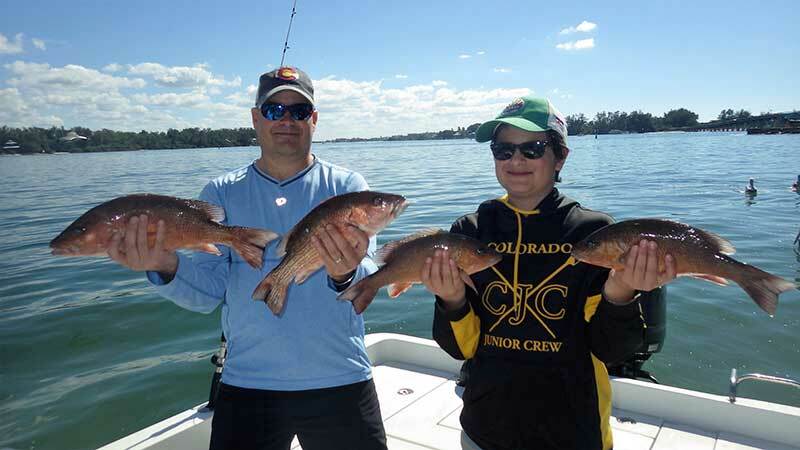 Using a bottom rig such as the fish-finder rig or knocker rig combined with live shrimp is resulting in black drum, redfish, flounder and sheepshead. Most hookups are occurring by casting baits under the pier or at least dropping them straight among the pilings. Keeper-sizes of the sheepies, black drum and flounder are being caught. As for the redfish, most catches are over the 27-inch maximum slot limit. Capt. Jason Stock is having great luck while fishing nearshore and offshore structure. By bottom fishing with live shiners on the hook, Stock’s clients are reeling up mangrove snapper, gag grouper and cobia. Fishing live shiners on the surface is resulting in kingfish and Spanish mackerel. While fishing reefs and wrecks in 30-60 feet of water, Stock is switching tactics and using live shrimp as bait to entice hogfish to take the bait. Fish 3-5 pounds are being taken with regularity. Capt. David White of Great White charters is fishing inshore with good results. While fishing deep grass flats with shiners under a popping cork, White is finding numerous fish. 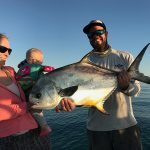 Bluefish, Spanish mackerel, seatrout, redfish, snook and flounder are all being taken on this method. White is finding the most success while drifting and casting baits. Fishing offshore is proving good for White’s clients looking for gag grouper. Dropping live pinfish or shiners to the bottom during morning tides is resulting in many hookups. Using shrimp as bait is producing a bite off shore, where hogfish are waiting for patient anglers weeding through the many grunts for a hog.